Author: Dawidoff, Nicholas Set In . 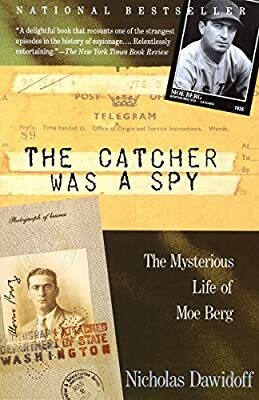 . .
Moe Berg is the only major-league baseball player whose baseball card is on display at the headquarters of the CIA. For Berg was much more than a third-string catcher who played on several major league teams between 1923 and 1939. Educated at Princeton and the Sorbonne, he as reputed to speak a dozen languages (although it was also said he couldn't hit in any of them) and went on to become an OSS spy in Europe during World War II. As Nicholas Dawidoff follows Berg from his claustrophobic childhood through his glamorous (though equivocal) careers in sports and espionage and into the long, nomadic years during which he lived on the hospitality of such scattered acquaintances as Joe DiMaggio and Albert Einstein, he succeeds not only in establishing where Berg went, but who he was beneath his layers of carefully constructed cover. As engrossing as a novel by John le Carré, The Catcher Was a Spy is a triumphant work of historical and psychological detection.